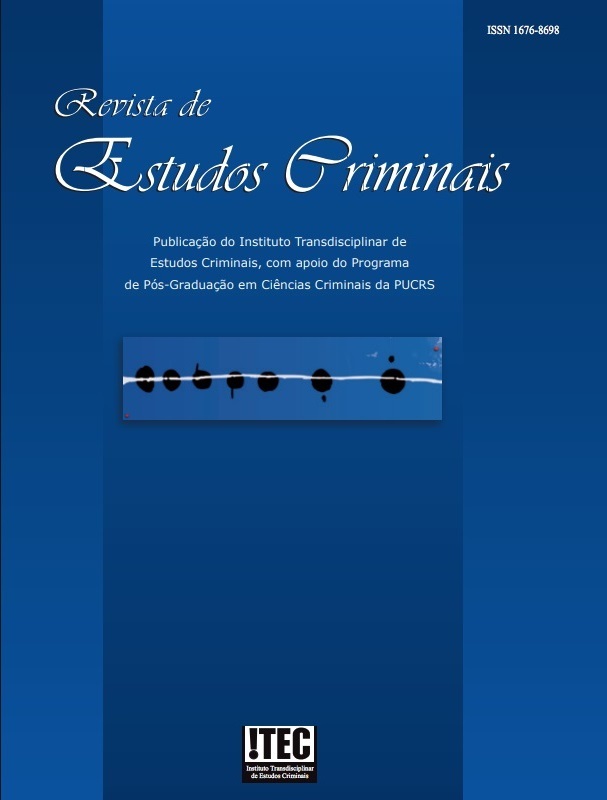 1.1 Sending editorial material to Revista de Estudos Criminais implies automatic acceptance of the guidelines for article assessment and publication, as well as the transferal of the copyright for the material. Once the article has been sent, decisions on editorial and graphic characteristics, distribution formats, availability and the publication date will be made by the journal. The author (and any co-authors) will be sent a copy of the journal in which his/her article is published as the only financial compensation for copyright transferal.Revista de Estudos Criminais is authorized to make the necessary changes and corrections required to adjust the text according to the publication guidelines. 1.2 Articles sent to Revista de Estudos Criminais must be unpublished in Brazil, whether in printed or digital format, and simultaneous submission to other journals is expressly prohibited. 1.3 Articles must be submitted by electronic mail only and addressed directly to the Editor at rec.artigos@gmail.com. They should be sent in text editor formats with the extensions *.doc, *docx, *.rtf or *.odt. Articles in formats that do not allow editing, such as Portable Document Format (*.pdf), will not be accepted. 1.4 Articles should preferably have a maximum of three authors, at least one of whom should have a PhD. Considering the high degree of exogeny (minimum of 75%), articles whose authors are from Rio Grande do Sul do not have publication priority. 1.5 Articles must be sent with a title page containing the authors contact details, including: full name; qualifications (including the university, institute or foundation they are affiliated with); complete address; email address. 1.6 Articles must be 10 to 20 pages long. Exceptional cases will be analyzed by the Editor during the preliminary assessment. The required font is Times New Roman, size 12, with 1.5 line spacing, upper and lower margins of 2.0 cm and 3.0 cm side margins, A4 format and justified. 1.7 Manuscripts must be written in Portuguese, Spanish, Italian or English. 1.8 The author’s qualifications should begin with their academic titles and teaching activities, advising of any possible affiliation with any funding bodies, followed by any practical legal activities. 1.9 Articles must begin with a 5 to 10-line abstract and the title and abstract must be shown in Portuguese and English. 1.10 Articles should also be preceded by 4 to 6 keywords, which should also be shown in English, as well as a numbered summary. 1.11 The references should be presented in line with NBR 6023/2002 (Standard of the Brazilian Association of Technical Standards– ABNT – Annex I). References should be cited in the footnotes of each page. 1.12 Text that authors wish to emphasize should be written in italics, not bold or underlined. Quotation marks should be used when citing other authors. 1.13 With respect to legislative references, legal diplomas do not need to be cited in the footnotes or bibliography at the end of the article. 1.14 The Editor of Revista de Estudos Criminais is not responsible for making changes when the publication requirements are not met. Articles that do not comply with the journal’s publication standards will not be accepted. 2.1 The format and content of articles submitted will be analyzed and assessed by the Scientific Committee of Revista de Estudos Criminais. 2.2 The author will be advised as soon as the Editor receives the article, implying automatic transferal of copyright and acceptance of the guidelines for article assessment and publication. A formal preliminary assessment will be performed before peer review. 2.3 The assessment will be conducted using the double-blind peer-review system. To that end, any information that might identify the author will be removed from the article and it will then be forwarded to two anonymous reviewers who are members of the Scientific Committee of Revista de Estudos Criminais. The reviewers can accept or reject the article, or accept it with provisions. 2.4 The anonymous reviewers will be available to the author, who will be advised of the assessment outcome and suggested changes in the event of acceptance with provisions. 2.5 In the event of disagreement regarding publication, the article will be sent to a third peer reviewer. 2.6 Once the article has been accepted, or modified by the author following acceptance with provisions, the Editor of the journal will assess its pertinence and the best opportunity for publication. The final decision on publication will be made by the Editor of Revista de Estudos Criminais. 2.7 In addition to the double-blind peer-reviewsystem, in exceptional cases the Editor of the journal may accept articles from guest authors when their scientific contribution is considered highly relevant to the topic in question. 2.8 The Editor of Revista de Estudos Criminais will be available to authors for any questions or complaints regarding the publication or rejection of articles. All communication should be by email at: rec.artigos@gmail.com.